Baling with steam allows farmers to bale quality hay all hours of the day and night. Although many farmers still prefer to bale hay during the cooler, nighttime hours, situations may arise where you will bale hay during the day. Some may even prefer to bale hay during the day instead of at night. The possibilities are endless when it comes to steaming hay. When baling with steam there are some general baling and stacking guidelines that one should follow. Hay baled in the evening or at night can be hauled and stacked the next morning. Hay baled in the early morning to mid-morning before high steam rates are used can be hauled and stacked later the same day. Hay baled from mid-morning through the early evening (hotter parts of the day) at high steam rates should not be hauled and stacked until the next morning. When baling in hot, dry conditions during the daytime hours, it’s possible that internal bale temperatures will exceed 115° F. To avoid discoloration of the hay in the stack, you should not stack hay that is above 115° F inside the bale. However, it is still okay to continue baling in these temperature ranges. In fact, with steam one can still make very good quality hay during the day and at these temperatures, but you will likely need to let the hay sit overnight before stacking. Although uncommon, when bale temperatures exceed 135° F, you should not continue baling. 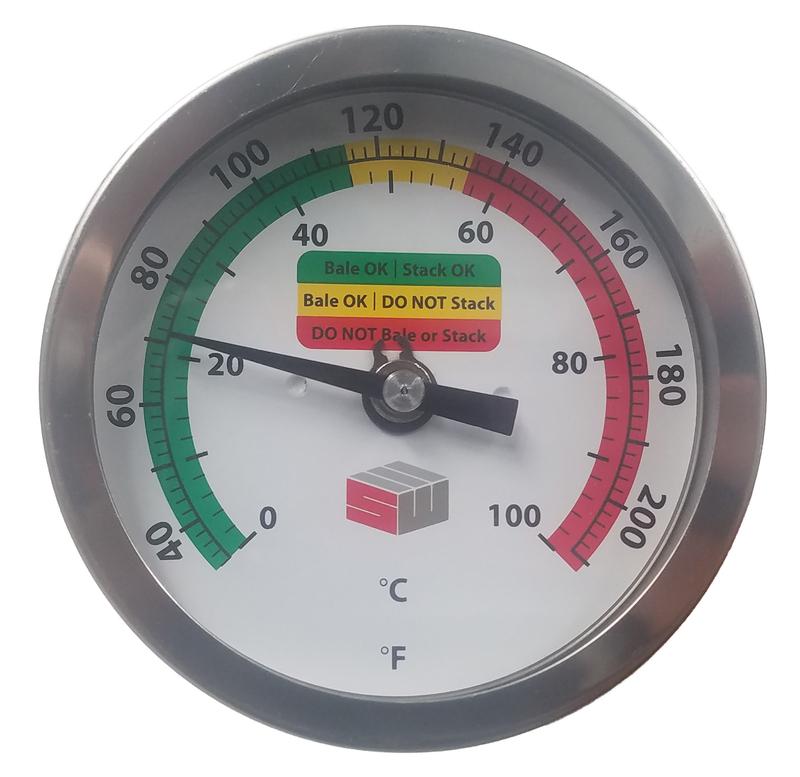 It’s helpful to use a bale temperature probe like the one we offer (see picture below). Pick up and haul the bales from the field using your normal method. Do NOT leave bales on a truck, bale mover, etc. for more than the time it takes you to drive a short distance from the field to the stack yard or field side. Long distance hauling or stopping for more than a few minutes may cause bale discoloration. 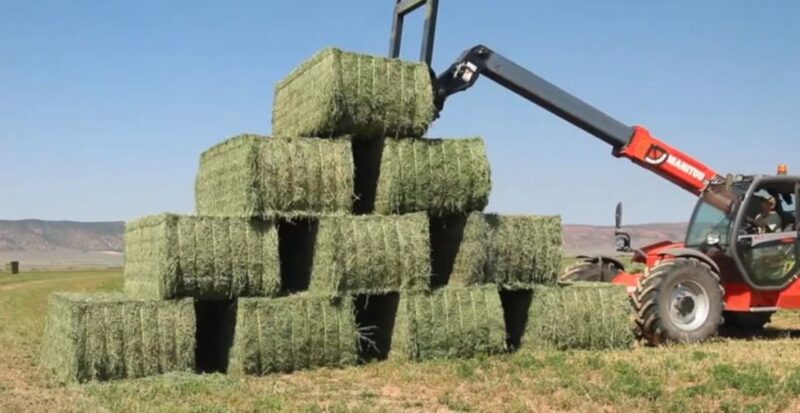 Dump hay in stack location and immediately re-stack the hay in a configuration that allows heat dissipation from all four sides of the bale. Use a telehandler to stack hay in a staggered pattern with 18-24” of space between each bale on each layer. Start the first layer with 18-24” between the sides of each bale. Add each layer with each bale straddling the spaces between the bales in the layer below. This allows heat dissipation through all four sides of each bale. Allow the stack to remain in this configuration for a few days to cool. Re-stack the hay in a tight stack when bales have cooled enough to stack conventionally (below 115° F). Read our blog posts for hay making tips, best practices, and updates.